The second symphony was recorded many years ago by Igor Markevitch, but it's only quite recently that both symphonies have appeared in a handful of versions. Despite being written in the mid-nineteenth century, the orchestration is strongly reminiscent of Beethoven. Emotional depths are not plumbed, but pleasure is all but guaranteed in the hands of Plasson, a specialist in French repertoire. 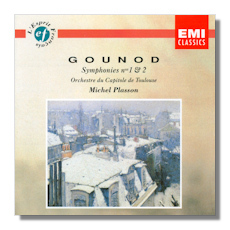 More rarely recorded is Gounod's delightful Little Symphony for winds and written in his old age. It's well worth seeking out.